Last chance - to register for the Razzleberry Cottage Class here in Canberra! Add a touch of soft elegance to any occasion when you gift someone with these gorgeous cards featuring Stampin’ Up!’s Cottage Wall designer series paper and the coordinating stamp set, Cottage Garden. 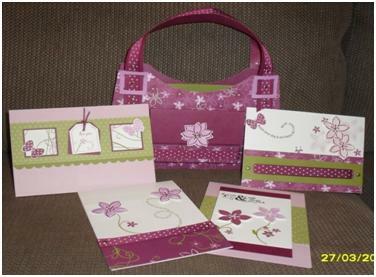 In this class you’ll create four cards and a handbag to hold them. The class is just in time for Mother’s Day. Drop a hint to the family about what you’d really like this year! Of course, you can always choose this as a Stamp Club at home project too!